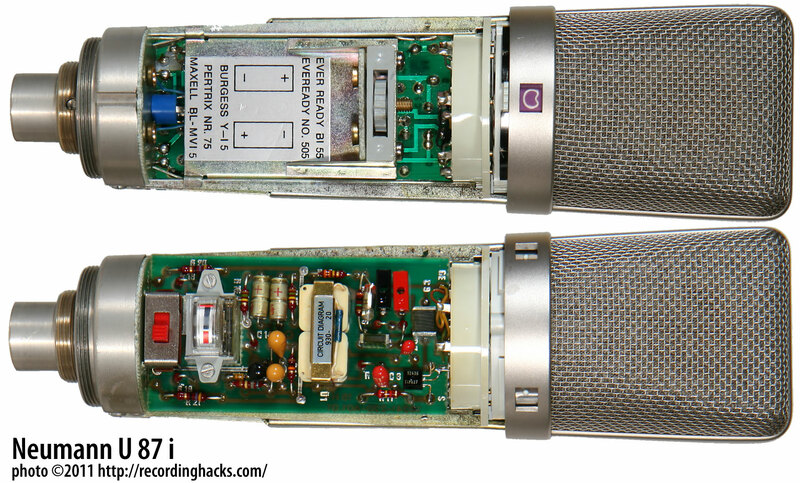 The U 87 was designed as a solid-state version of the U 67 tube microphone. 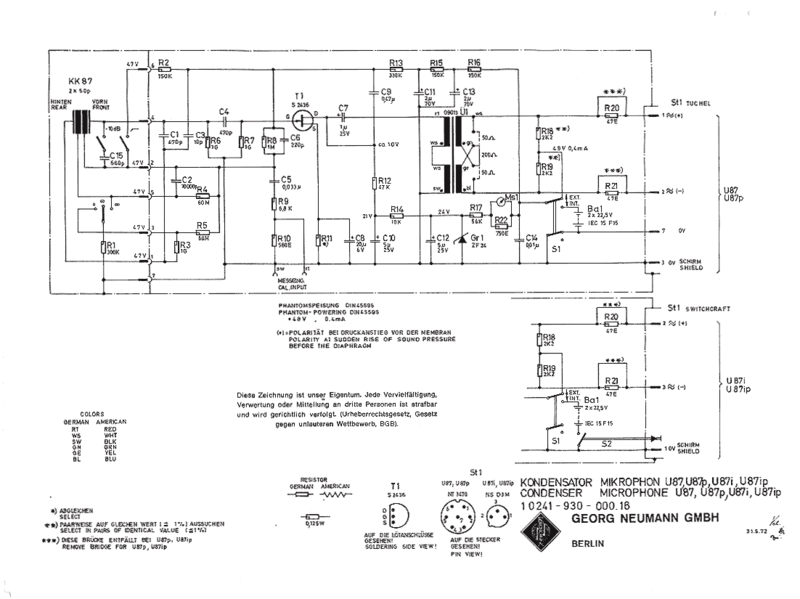 It retained the K67-style capsule of the U67, but replaced the tube amplifier circuit with a FET/transformer design. In short, the U87 was a tripolar FET condenser with a transformer-coupled output. A switch below the headbasket allowed selection of Cardioid, Omni, or Figure-8 patterns. 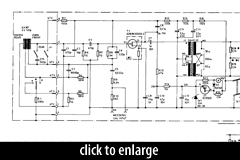 and it therefore connected to the amplifier circuit by four wires rather than three. The capsule mounting screws were “sleeved” to prevent an electrical connection between backplate halves. These changes were required to support the Figure-8 polar pattern, which otherwise would have required more power than the 48V phantom power supply could provide (without a DC-DC converter). Note that both the K67 and K87 capsules used a 40-micron spacer between the two backplate halves. In the K67, the spacer is aluminum. In the K87, the spacer is made of (non-conductive) plastic. The K67 (now called K870/67) and K87 capsules are said to be mechanically and acoustically identical. The K87 capsule was designed for a 60V polarization voltage, but was run in the U87(i) at ~46V; as a result, the U87(i) had ~10mV/Pa lower sensitivity, and 3dB lower signal-to-noise ratio than the AB-powered U77 or the revised U87, called the U87A(i), both of which employed a DC-DC converter to produce a ±60V supply for the capsule. 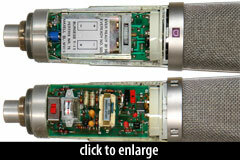 The body of the U87(i) housed an optional pair of 22.5V batteries. This space was repurposed to store a DC-DC converter when the U87A(i) was developed in 1986. The mic’s output impedance was 200Ω. It could be changed to 50Ω by the user; this modification required a solder gun, according to Neumann literature. 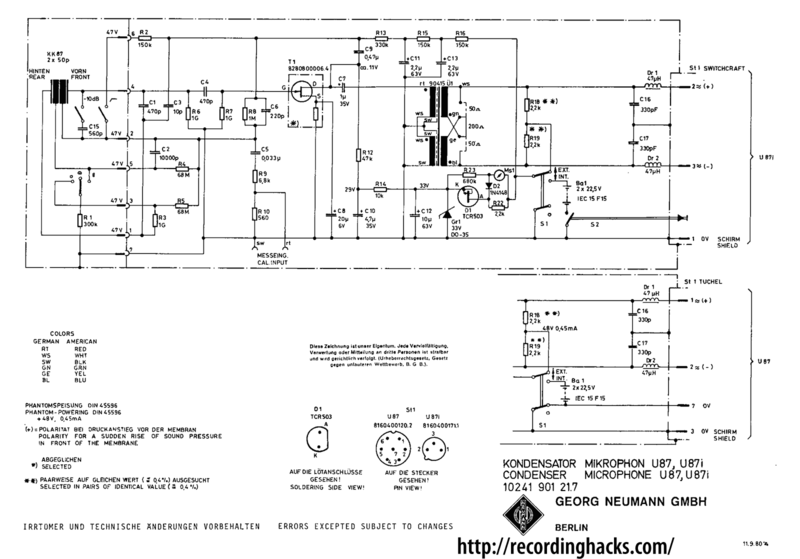 According to Klaus Heyne, over 20 variants of the U87(i) circuit were created by Neumann. These changes did not affect or alter the sound of the circuit, even if the components and layout of the PCB changed over time. Curiously, some of the very early U87 microphones even lacked a battery compartment. Does the vintage U87(i) sound different from today’s U87A(i)? [A]side of a slightly repositioned high frequency boost (up 2dB at 10k, vs at 8k in the old model) the audio circuitry is virtually identical to that of the old model prior to 1986, both in performance and components. My first U87, which I still own, was made in 1967. 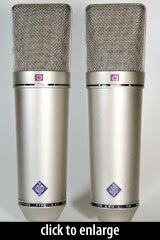 Just yesterday Neumann sent me a brand new one for a client. I plugged both in, and, after adjusting for output differences, I could have easily used both as [a] pair in a critical stereo apllication. 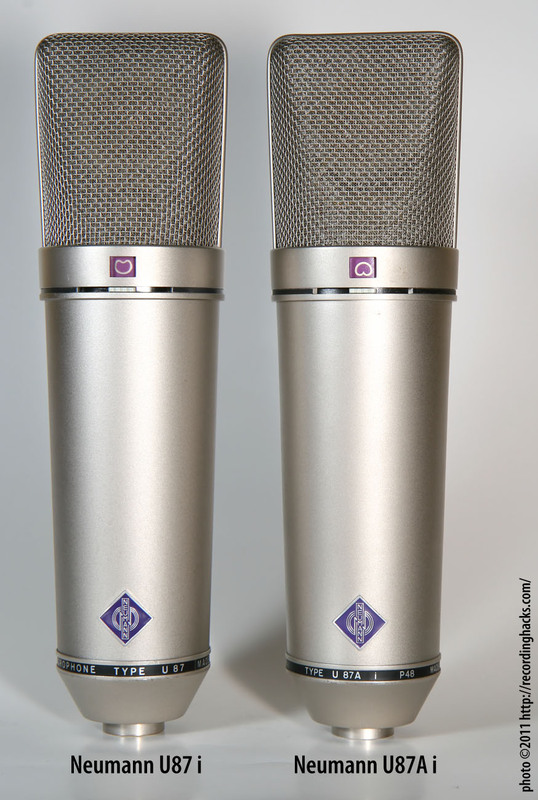 The Neumann U 87 is also known as: U87, U87i, U-87i, U 87 i. The mic was released in 1967.